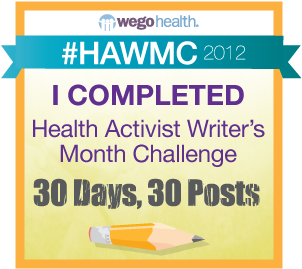 For the next 30 days I'm participating in the WEGO Health Activist Writer's Month Challenge. Today’s topic: A Health Time Capsule. Pretend you're making a time capsule of you and your health focus and beliefs -- that won't be opened until 2112. What's in it and what would people think of it when they found it? This prompt got me thinking about how far modern medicine has progressed in 100 years. A hundred years ago, people who had myasthenia gravis died. People who had diabetes died. People who had thymoma cancer died. 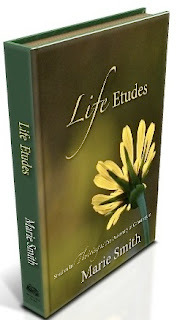 A hundred years ago any of the challenges I have either faced in the past, or am dealing with now, would have killed me. Treatment is not without problems. The biggest problem is pain. Treating myasthenia gravis is painful. Chemotherapy makes me sick. Medication side effects cause frequent muscle spasms. Yes, there is treatment for MG, but it also has a cost. In my time capsule I would include the pills I take. I’d include all of these artifacts from my diabetes treatment. 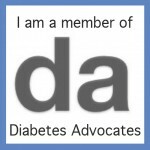 The treatment of diabetes has gotten better and more sophisticated since insulin was first used in 1922. We aren’t far away from creating an artificial pancreas and one day research will provide a cure. I don’t know if it will be in my lifetime, but it is coming. In the future diabetes and MG will be curable, maybe even preventible. How will the people who open my time capsule respond? I think they would be amazed. Did people really give themselves insulin injections, prick their fingers and test their blood sugar? Did they really do this every day? In the future people won’t be able to imagine living with diabetes, any more than I can imagine my life without insulin and my meter. When they look at the myasthenia gravis stuff, I think the people in the future will shake their heads, wondering how we managed to survive. Unlike diabetes, MG research has been painfully slow. The insulin created in 1922 has been updated and refined repeatedly. This is not true with MG medications. I still rely on medications created in 1936 and in 1940. Think about how far medical science has advanced since 1940. With MG treatment I'm stuck in the early part of the 20th century. A brand new updated medication with no known side effects has been invented for MG. But, it hasn't come to market. I've been waiting for this medication since I first heard about it in 2002. I used to wait with hope. One day soon the will be a new treatment. Then another year went by. And another. Now I wait with my back turned to the new medication. If it comes to market I'll be glad, but I refuse to put my life on hold waiting for it to arrive. Instead I'll keep taking medication invented 70 years ago, painful side effects and all. All of these pills will be in my time capsule and future scientists will be horrified by them. When it comes to current MG treatment, our best medical innovations will seem barbaric and primitive to future generations. It will be like surgery without anesthesia seems to us. As a long term chemo patient, I believe chemotherapy will one day be looked at with shock and horror. How could they do this to patients? Unfortunately it is the best we have. My two choices are life with permanent chemo, or death. In the future there will be something better. I hope to live into that future. I take chemo now so I can live long enough to see a new day dawn. New treatments are coming. I know they are. As I continue to press forward with both MG and diabetes, I am constantly aware that every year brings new understanding and innovations. As I’m getting ready to try an insulin pump next week, I cannot help but feel amazed by medical progress during the past 100 years. Here’s to medical innovations that help people thrive now and to innovations 100 years from now. 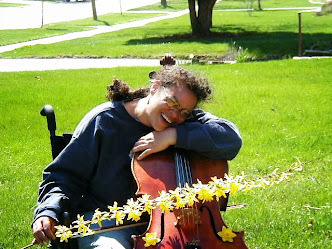 This post was written from a blog prompt for April 1st from The Health Activist Writer's Month Challenge at WEGO Health.